Jean-Luc studied at the "Beaux-Arts" in Nancy and Paris, France, yet learned more from observing Nature and its intrinsic stargates. For his graduating thesis from the University, he built a domed Cymatic sanctuary with light and sound in 1969. 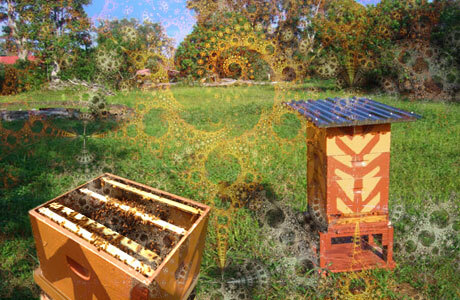 Jean-Luc was born as a natural visual-intuitive, a modern shaman artist who can navigate dimensions and retrieve psychic snapshots of those realms to share with audiences; awakening in them the awareness of parallel realities where "sentient beings" communicate via ethereal frequencies forming images with colors and geometries. Jean-Luc spent the 1970's in French Polynesia presenting shows at the aquarium; next he was setting stage shows in New Zealand with Limbs Dance Company, then became an illustrator with Simply-Living Magazine, an Australian publication featuring alternative health, sustainability and travel; he assisted an Australian TV show named Extra-Dimensions, by designing their advertising brochures and opening screen images for this innovative television series with dolphins 1980-83. He traveled with Interspecies Communication and the whales in the islands of British Columbia, Canada in 1984; and then co-founded and co-authored with Joan Ocean, Dolphin Connection Interdimensional Ways of Living - producing shows, books, posters, films and many international seminars featuring dolphins, whales and 9 journeys with Sasquatch contact in the forest at night. Jean-Luc co-convened multiple Dolphin and Teleportation conferences and seminars in Asia, Europe, North and South America; and presented his art films in many venues including the most recent event, The Star Knowledge Conference with the Native American elders in Palm Springs, California. 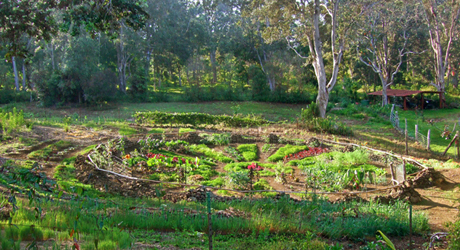 Jean-Luc lives in Kealakekua, Hawaii on his sustainable farm, Sky Island Ranch, where he continues his art projects in communion with nature. Jean-Luc was born in France with an innate fascination for the wonders of Nature... He always could see beyond physical Nature, beyond macro and microscopic. 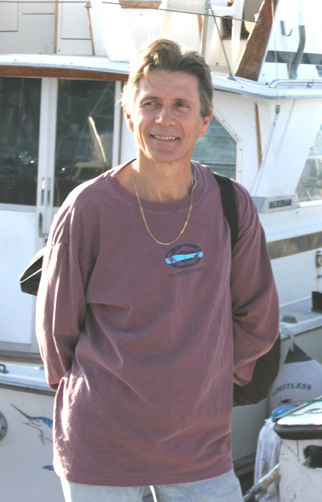 Bozzoli moved to the South Pacific islands in 1970 for the purpose of studying the correlation between sea life and the structures of parallel realities . While on his boat in 1976 a lone dolphin vocalization inspired new paintings of platonic underwater crystal structures. After meeting N.Z. sailors Jean-Luc traveled to New Zealand in 1979 where he was literally 'zapped by the Whales" spurring him to make a multimedia slide show with Limbs Dance Company at Auckland University. 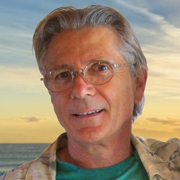 Soon after, in Sydney he illustrated "Dreamtime" experiences with a group of Dolphin mystic researchers and writers for Simply Living Magazine. Bozzoli also worked with the filmmakers producing: "Monkey Mia" and "Dolphin Touch". More travel adventures occurred while living in the early 1980's between Australia and Singapore where he artistically disclosed some of the overlapping worlds of ancient cultures such as Atlantis & Lemuria parallel to the Mahabharata & Ramayana within and beyond East-West cultures : these can be understood as the geometries that are the blueprints of thought, architecture and philosophy. Meanwhile the question stayed with him: How are the whales and dolphins perceiving the matrix or records of our coexisting life on Earth? In 1984 after an invitation to gather with many of the world Shamans in Ojai CA, Mr Bozzoli drove through most of California presenting Art Shows with slide-projectors. There he met Joan Ocean in San Francisco. That Summer, following an " Interspecies Communication" expedition with the Grey and Orca whales in the Canadian wilderness, Jean-Luc and Joan began traveling extensively to share Jean-Luc's visionary and inspirational Art Films to people at theaters, resorts, churches, centers, universities and homes worldwide, making many friends along the way. Jean-Luc's unique and beautiful art includes the cetaceans, and advanced sacred geometries which transmit the experiences of colorful animated miracles of transformation -- morphing, evolving and touching our hearts with Beauty and ancient ethereal memories. This audio-visual presentation is entitled: Dolphin Connection. It reflects the inner world of the multi-dimensional dolphins. It is their finest communication within us, at the cellular level. In the process it gently moves us beyond our limited linear reality. During this time Joan and Jean-Luc were invited to swim with dolphins in many locations, worldwide, and to experience their higher frequency communications directly as Energy. Our mind see all life forms as linear ideas, while dolphins perceive everything as holograms: 3d, 4d, 5d... expanding energy fields. 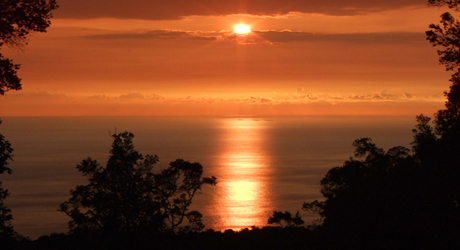 In 1988 Jean-Luc and Joan settled on the Hawaiian Island of Oahu, inspired by its beauty. There Jean-Luc continued to produce his fascinating extra-dimensional paintings while Joan, inspired by the dolphins, authored the book: Dolphin Connection; Interdimensional Ways of Living. Soon they relocated to the Big Island of Hawaii where the Spinner dolphins were calling them. Every day they swam for 4-5 hours among the dolphin pods in beautiful Kealakekua Bay (pathway of the gods) learning directly from the highly intelligent dolphin pods. In 1988 they participated to the First International Dolphin and Whale Conference in Australia in 1988 and also the subsequent conferences on the Big Island. These were followed by the convening of other Dolphin Connection Conferences: The Power of Sound in Kona with many exceptional sound-healer speakers and the 2005 Conference featuring world renowned speakers, doctors, remote viewers and whistle blowers regarding ultra ways of communication with dolphins and our friends from distant civilizations in space. When we can learn from Nature ( flowers, birds, dolphins ) her harmonic language, we will have the consciousness to access to the sacred records of the cosmos: which is Oneness ( ultimate fulfillment ). In 1990 living right on the dolphin, home, bay they documented their Human-Dolphin interaction in a video called "Open to the Sea". In Quebec he illustrated and published a children's book " Boule de Reve " assisting terminally ill children through their transition. A dolphin with wings who flies to another dimension. In his next geographic triangular journey, between Hawaii, Oregon and Vancouver BC, Jean-Luc practiced his skills with 3D animation. There, he realized his first visionary Odyssey called " Merkabah: Voyage of a Starseed ". Could imagination be a limited concept of our linear mind and an acceptable artistic disguise... for ultra communication of global codes?. Do artists, like JL, use their extra sensory abilities with flowing forms, music and colors to resonate and harmonize with the human heart field of intelligence?. So does the human heart have a field of intelligence? and could it be an expansion of our mind/brain. Imagine communicating with beings of an advanced Civilization... wouldn't we need to improve our telepathic and holographic sonar imagery... and we could certainly learn now with the whales and dolphins... couldn't we? Now, living on the tropical island of Hawaii, combining Sustainable garden living with producing art on the computer screen, Jean-Luc has spent the past 7 years creating a new DVD called TRANSMUTEO. A visionary film that heralds the rebirth of our divine feminine qualities : intuition, creativity, and renewal.